The HXX concept maximizes legal payload for customers and improves operational efficiency. "Maximizing productivity while adhering to strict weight regulations is a constant challenge for vacuum excavation users," Schmitt said. "Weight enforcement is an important issue within the industry, as overweight fines can be significant." The placement of the debris body and water tank on the concept's chassis ensures equal distribution of the payload on the axles, regardless of how much water is in the tanks. This design is an improvement over previous vacuum excavators configured with sloped floors in uni-body designs where weight shifts as water is used and debris is loaded, often resulting in lost payload capacity. Each component of the HXX concept truck was purposely placed to ensure the entire chassis gross vehicle weight rating (GVWR) is used. A new PrecisionFlow™ water pump system on the HXX concept features a single-piston design which is capable of higher flow and pressures than a triplex water pump system for superior production and reliability. "This new water pump system features half the moving parts of a traditional hydroexcavation water pump, eliminating more expensive and less reliable pressure regulating mechanisms or unloading valves and enabling quick and easy servicing in the field," Schmitt said. The HXX concept features Vactor's Park-N-Dig™ quick operation design, which reduces set-up and tear-down time between jobs. In addition, the concept features a seven-inch display featuring real-time operational and performance information feedback to allow the operator to maximize productivity. 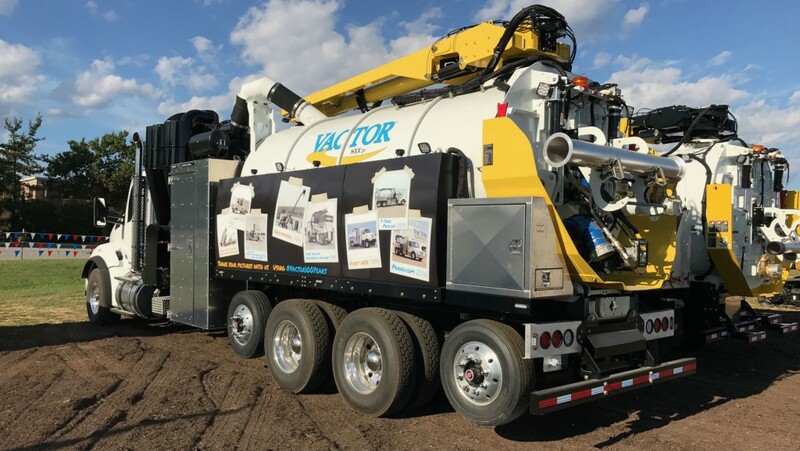 The HXX concept also features Vactor's Bluetooth service connectivity tool and on-screen diagnostics for quick and easy field troubleshooting if necessary. "Everything about the HXX concept truck was designed with operator safety, product reliability, productivity and serviceability in mind," Schmitt said.